Rural electrification through conventional methods such as grid connection and diesel generators is either very costly, or - in the case of grid extensions – simply not in the plans for the foreseeable future. Conventional methods result in emissions that are harmful to human health and the environment. They add carbon dioxide to the atmosphere, which traps sunlight and causes global climate change. With the rise of fuel prices, diesel generators become an economic burden on low-income families, eliminating the economic benefits of electricity. It is a sad fact that remote rural communities have to pay more to enjoy diesel and petrol-fueled electricity supply. The additional costs very often cover the long distance transportation. Hence they pay twice if not three times or more the actual market price for every liter to power generators, often for less than six hours a day. Already burdened by poverty, paying such a high cost for energy is like rubbing salt to their financial wound. Yet having electricity provides light at the end of the tunnel to raise their standard of living. The big question is: what are the alternatives? One is by harnessing what has been freely available in the communities’ own backyard: water power or in its technical term, hydropower. Hydro power is the oldest form for technology to harness energy from natural resources since the invention of the water wheel by humans. It uses simple but practical form of spinning wheel to harness power from water that is still in use today. Throughout my journeys in working with rural communities to develop their own micro hydro system, I have came across many innovative efforts community technical champions in trying to design their own micro hydro system. Some was successful but some does not really work to its desired intensions. The idea is there, but they lack the technical knowledge particularly on Civil and Electrical engineering. 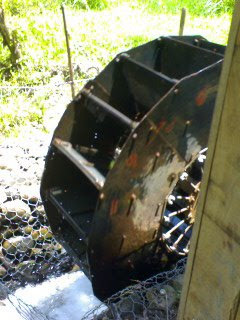 One of the most interesting homemade micro hydro systems that I came across was in Kg. Garas, Tambunan, where our unsung hero and maverick Kampung engineer Mr. Hamid Jasmin, through trial and error developed his own undershot waterwheel from scrap metal and second hand automotive parts. He designed this waterwheel all from the knowledge he acquired from a small handbook, he named this waterwheel “Balasut”. Hamid creatively used old cement mixer sprockets and a used car gearbox for the speed increaser to enable the waterwheel turn the generator to a specified speed to generate electricity. The design is simple and cheap by making use of second hand parts and scrap metal. However there is still need for improvement on the design particularly on the civil structure design, mechanical and electrical control system. The prototype that was installed in Kg. Garas, Tambunan require the drive belts to be changed once in 3 months. The drive belts cost can cost up to RM 400 making it the highest maintenance cost otherwise the operational cost will be minimal. It is recommended that the system should use flexible coupling from drive shaft to the gearbox. One of my key concerns on this system is the lack of safety on the electrical system. The system does not have any load controller and voltage regulator. The voltage of the system is very unstable mainly due to the problem from the drive system that controls the speed of the generator. Because of the inconsistent speed of the generator, the voltage sometimes reaches 350 volts! This is highly dangerous to users. Electrical appliance especially sensitive electronic devices can easily be damaged when connected to this voltage. Another concern is the lack of understanding of the importance of hydrology and civil works. Based on my observation, there is some serious concern on the location of the waterwheel which is located too near to the river bank, making it very vulnerable to flash floods. This is proven on one of the system that Mr. Hamid develop for Sabah Parks in Kg. Buayan Penampang which washed away by flood waters in September 2008. The other interesting design I came across was in Kg. Abok Mawan in Serian, Sarawak. I was by chance visiting the neighboring village of Kg. Abok Aping. I met with another maverick kampung engineer named Jacob Emang and his son Ziegler. From their own initiative fabricated many different water wheels including a giant 15ft diameter bucket wheel installed in his fish pond, this bucket wheel is fabricated all from scrap metal. From his basic technical knowledge, Jacob designed a small w aterwheel that uses two water jets to turn it. He called it “pipeton” wheel, mainly because it looks like a pelton turbine that he made from cut of half section of 4”pipe and welded to a flat belt pulley. His initiative have since caught the attention of a University Masters student and a local business man that worked together to get this prototype to be installed in Kg. Abok Mawan. Since it was installed it has been supplying electricity to the long house. However this system still requires some improvement particularly in the electrical control system. These examples have shown how creative the community in trying to solve their problem. I think what is needed is some form of support to have technology transfer and trainings for the communities to enable them design and develop their own micro hydro systems. One of the good examples that can be replicated in Malaysia is the Micro Hydro Power Program (MHPP) in Indonesia that was supported by GTZ. This program was to facilitate technology transfer to local fabricators and manufacturers of small hydro turbine in Bandung. The program was very successful that today many of the local manufacturers are now producing very high quality turbines and control system for local installation and also for export. One of the participants of this program is HEKSA HYDRO; they are now one of the top designer and supplier of micro hydro system in the region. I have the opportunity to engage with HEKSA HYDRO in many of my micro hydro projects in Sabah and Sarawak. We believe that similar program like the MHPP in Indonesia can benefit the local manufacturers to develop small business in micro hydro. Such program will also improve the local expertise in micro hydro to further develop their ideas to another level. Perharps MOSTI will be able to support such initiatives to improve the existing designs and use it for rural applications. PACOS have been conducting pilot projects and found that micro hydro is a better option to rural electrification through small scale renewable energy program.